Academy Sports + Outdoors of Katy, Texas, is recalling about 2,100 crawfish kits with strainers sold in the U.S. and Canada. The kit's propane hose can melt and/or burn, posing a fire hazard. The firm has received 14 reports of hoses melting or catching fire. No injuries or property damage have been reported. This recall involves the Academy Sports + Outdoors Outdoor Gourmet 100-Qt. 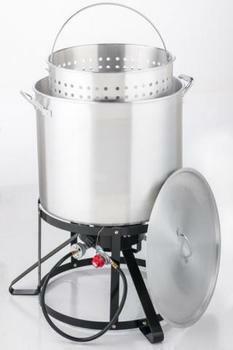 crawfish kit with strainer which is an outdoor appliance used to cook crawfish and other seafood in a 100-quart pot. The crawfish kit includes a hose assembly that connects the burner component to an external LP fuel tank supplied by the consumer. Model number FSOGBG4201 is printed on the silver label located on the burner component. The kits, manufactured in China, were sold at Academy Sports + Outdoors stores and online at Academy.com from March 2014, through May 2017, for about $130. Consumers should immediately stop using the recalled 100-quart crawfish kits and contact Academy Sports + Outdoors for instructions on obtaining a free replacement hose assembly. Consumers may contact Academy Sports + Outdoors customer care toll-free at 888-922-2336 from 7 a.m. to midnight (CT) daily, by email at customerservice@academy.com, or online at www.academy.com and click on the Product Recalls link for more information.